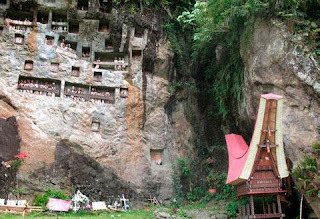 Batu Lemo, prostate Tana Toraja Place of burial or funeral bodies shaped holes in the wall rock. 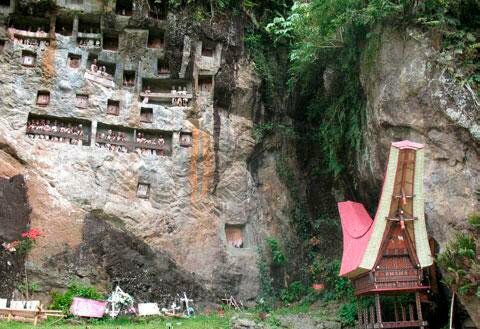 This place is the result of human creations remarkable Toraja. How not wake that has existed since the 16th century were made ? ?by means of sculpting. At that time, sales of course with very simple equipment. Lemo is located in the village (valley) Lemo. About 12 kilometers south of Rantepao or six kilometers north of Makale. Lemo named because some models burrow circular stone and mottled fruit resembling an orange or lime. The graves stones are considered the burrow paa '. There are 75 holes in the wall rock. Some of them have statues lined the so-called tau-tau. The statues are a symbol of social standing, status, and their role during the life of the local nobility.